Those looking for more footage of the Chairiot Solo in action will soon be given an inside look. 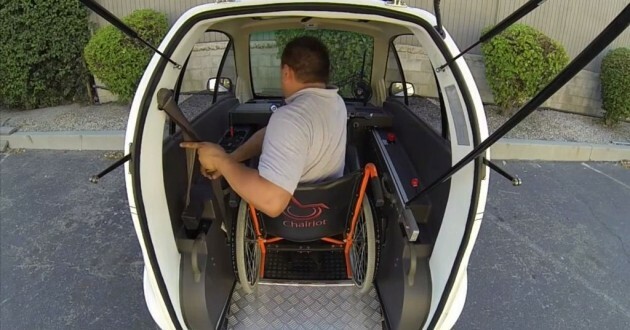 It’s been almost a week since The News Wheel first reported on the innovative, electric, single-person vehicle for drivers with disabilities, and already more news on the Chairiot Solo is breaking! UPDATE: Watch the new video, just released, below! The announcement came today from President and CEO Ralph Megna of Chairiot Mobility that the State of California has awarded a vehicle manufacturer’s license. This means, after a rigorous amount of paperwork on everything from production facilities to VIN cataloging, you’ll finally be seeing dealers and owners parade the Chairiot Solo. We had these same questions, and luckily Chairiot is preparing new video, which The News Wheel is proud to offer a look into! We’re torn between the blueberry violet option or the snazzy black lightning bolt. We originally covered the Chairiot Solo last week, discussing everything from the overarching intent to the technical specs of the electric pod. While the footage showed the Solo in action, enough to spark interest, it didn’t provide a look on the inside– and that’s what counts. On Chairiot’s newest promotional footage, the Technical Director for the brand, Ruben Fernanez, takes the viewer on a step-by-step tour through the Solo’s features. While the final video is still receiving its final editing touches, following are some of the highlights featured. A remote control allows the entrant to raise the rear entry door without manually pulling on it (or quickly wheeling backward to avoid a face-on collision). Once wheeled up the entry ramp, the wheelchair is caught and locked by a docking mechanism that holds it safely in place. When exiting, a release switch for the clasps can be pushed. The controls on the Solo prove that the vehicle is more than just some half-hearted novelty machine looking to cash in on a demographic. It’s truly designed around the needs and capabilities of its driver. While most people are used to having power window and A/C controls at their fingertips, the Solo offers much more. Because an individual operating the Solo would be unable to control the acceleration or brake with his/her legs, a hand-controlled twist-and-push lever is offered on the right side of the steering console. 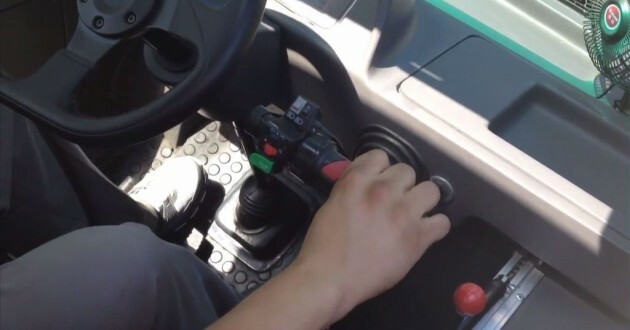 Because that requires one hand to control, a nifty assistance knob is implanted on the steering wheel, allowing for easy turning single-handedly. Perhaps it’s because the video was filmed on a particularly sunny day, but the spacious cabin and high surface-area of windows stand out dramatically. With the overhead sunroof and the elongated, vertical windshield, the Solo appears to offer plenty of visibility. And possible blind spots weren’t mentioned, but based on the image above, that doesn’t seem to be a significant issue. Finally, make sure that electric Solo gets plugged in to recharge. It takes a standard three-prong 110 volt extension cable, which is much more convenient for the average car owner than most electric automobiles these days. A full charge will take someone between 40-50 miles, about half of a full-size EV. While the Chairiot Solo would have a long way to go to becoming highway-ready, especially since little as been mentioned about the Solo’s safety features, the vehicle stands out as a feasible neighborhood electric vehicle (NEV) for speeds below 35 mph. 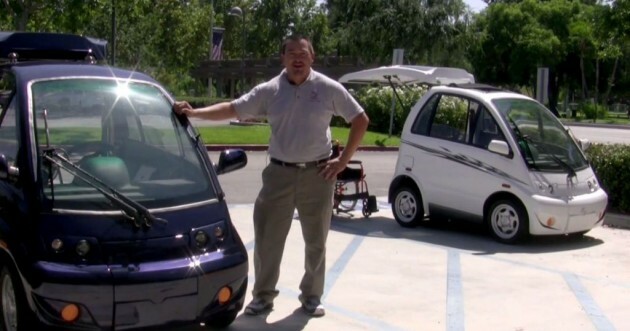 The price tag of $19,000 is a bit much, comparable to a full car, but is less than the price of a full electric vehicle. 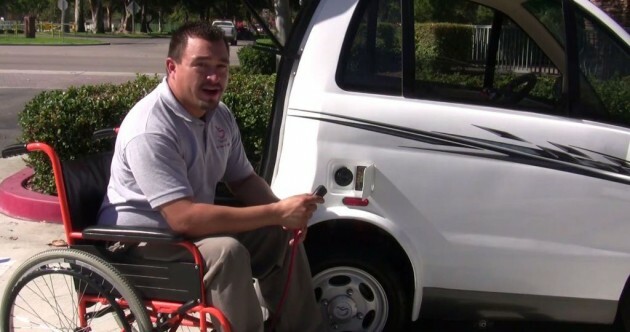 Considering the electric fuel is self-sustaining, and tailored specifically toward a certain demographic, in-town use of the Solo could save money in the long run. Once the final version of the video is released, we’ll feature it here in our coverage. For now, as final edits and additions are made to it, we’ll imagine the Chariots of Fire theme as the soundtrack for it. UPDATE: Watch the New Video Here! To get a perspective on how a mobility innovation like the Chairiot Solo is being reacted to in the community, we reached out to a local transitional program for high-functioning young adults with disabilities. “Those in our program first learned the news on the Chairiot Solo through The News Wheel earlier this week, and general reaction has been that it’s ‘so cool,'” said Vicki Widmar, curriculum coordinator for echongU (a division of Ohio’s Echoing Hills Village). “Everyone deserves to have the same travel mobility available to them, but constantly relying on friends, family, or public transportation can be disheartening. 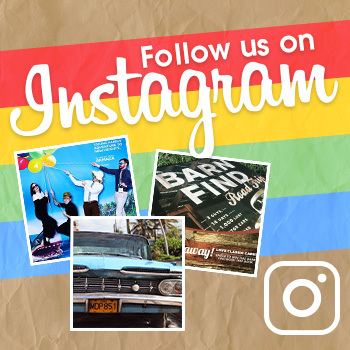 This will give many people the freedom to see others, do things in town, and build relationships independently. We here at The News Wheel share the same enthusiasm and anticipate hearing more news on the Chairiot Solo.